Those who feel that gamers never participate in the community, stand back! With events like the ExtraLife and 'Double-Up' charity event, RIFT's players have been shattering records and expectations. During last month's coverage, we were able to sit down with event founder and Gaiscioch Family Leader Ben "Fogladha" Foley about the 'Double-Up' charity drive run by the Gaiscioch, a social gaming community. The drive encouraged gamers and non-gamers alike to purchase stuffed animals through the guild's registry page. Animals were then shipped to Foley where they were in turn shipped to various Portland area charities. I checked with various tax professionals who told me to not even try, or to let no money even touch my hands. So then I found the Khol's charity event that for any animal that you buy they donate 100% to children's education and healthcare, and figured: Why not double up and give the animals to charity? 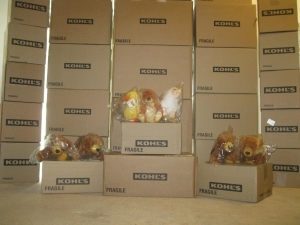 We originally set the goal of shipping 200 stuffed animals. Within the first week of the event, we shipped over 300." The event ended on March 31st and raised 405 stuffed animals. The proceeds from the purchases benefited the Khol's Cares Program. In addition, the animals were received by Raphael House,Insights,Bear and Buddy Program and Candlelighters for Children With Cancer. This is not the end of the Gaiscioch's philanthropic ventures, however. According to a statement released by Foley, there will be another charity drive to coordinate with this year's ExtraLife charity event in October where they have set a $10,000 goal.